The operation panel can be moved manually up to 30 degrees to the right and left. It can be adjusted horizontal when operating the machine on a slope. This makes it easy to load and unload a truck and to climb over bumps during transportation and operation. The mowing part automatically moves up and down, facilitating smooth and easy operation on a rough ground. * Low center of gravity enables stable operation. 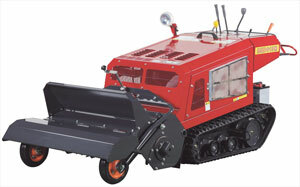 * A crawler is used for the traveling part for enhanced traveling performance and stability on rough grounds. * The engine output is higher than is required for the prescribed mowing width, enabling efficient mowing of dense grass. The specification may be revised for improvement without notice.